In the spring semester of 2014, I taught a new course (for me and for my department): a junior seminar (HSCI 3993) designed to give junior history of science majors a serious research experience before they embarked on their senior capstone projects. I had each of my students pick a sixteenth- or seventeenth-century book from the History of Science Collections at the University of Oklahoma. They worked with the digitization laboratory (the DigiLab) to produce high quality digital images of their chosen book, and they wrote research papers and iBooks about their book. 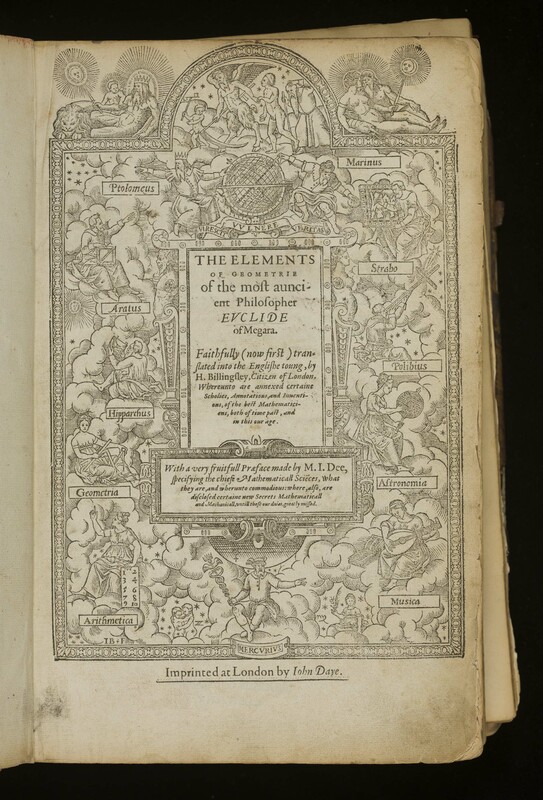 One of my students, Jonathan Self, chose the first English translation of Euclid’s Elements, published in London in 1570. The book has a series of pop-up diagrams to illustrate three-dimensional geometric shapes. The book is very commonly referred to as “John Dee’s Euclid,” after the famous English mathematician, astrologer and sage, known for his conversations with angelic spirits. Dee wrote an introduction to the English translation of Euclid, but it is unclear whether he contributed to the book in any other way. It appears to have been Henry Billingsley, a far less well-known figure, who did the major work of translating the work. Jonathan wrote a paper on this book. He also made an iBook, which he titled “Billingsley’s Euclid,” that really showcases the spectacular three-dimensional illustrations. The iBook is available for download from the iTunes store. Although this wasn’t essential to his research project, Jonathan and I were both intrigued by the many marks of ownership in OU’s copy of the English translation of Euclid. Would it be possible, we wondered, to figure out some of the different people who owned this book over the centuries? What follows is the (admittedly still incomplete) results of our investigations into the provenance of this particular edition of Euclid. I will begin with the most recent owner and work backwards chronologically. Identifying Evans was simple. Next we tried to figure out who the other bookplates belonged to, and who else had put their name in the book. I tweeted pictures of the bookplates and signatures and asked if anyone recognized them. I got some very generous and helpful replies from Andrew Aberdein (@andrewaberdein), Professor of Philosophy at the Florida Institute of Technology, that enabled us to identify two more owners. 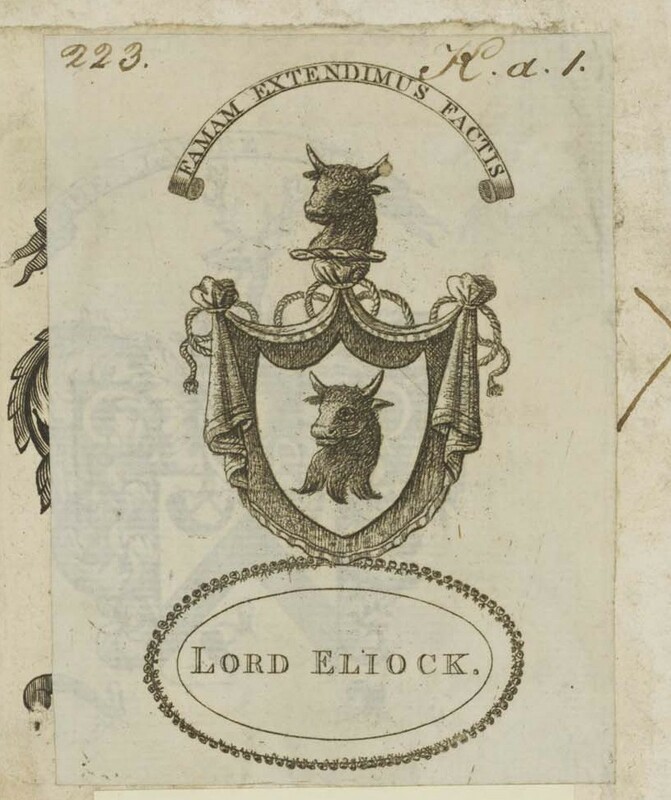 The bookplate right above Evans’ plate is that of James Veitch, Lord Eliock (or Elliock) (1712 – 1793). According to the Oxford Dictionary of National Biography, Veitch was Scottish. He was educated at Edinburgh University and then at Leiden. He served at the court of the Crown Prince Frederick of Prussia (late Frederick II, “the Great”) for several years. He returned to Scotland and practiced law. He was well connected in literary and intellectual circles. He became a judge in 1761, acquiring the title Lord Elliock. Veitch put his bookplate over an earlier owner’s plate. It is possible to make out a bit of the previous owner’s motto under Veitch’s plate. I believe that the motto on the underlying bookplate reads “sine labore nihil” (nothing without work). Professor Aberdein informs me that this is the motto on the Colebourne coat of arms. On the verso of the title page, the name “William Coleburne” has been crossed out. I have been unable to find biographical information on William Colebourne (or Coleburne). 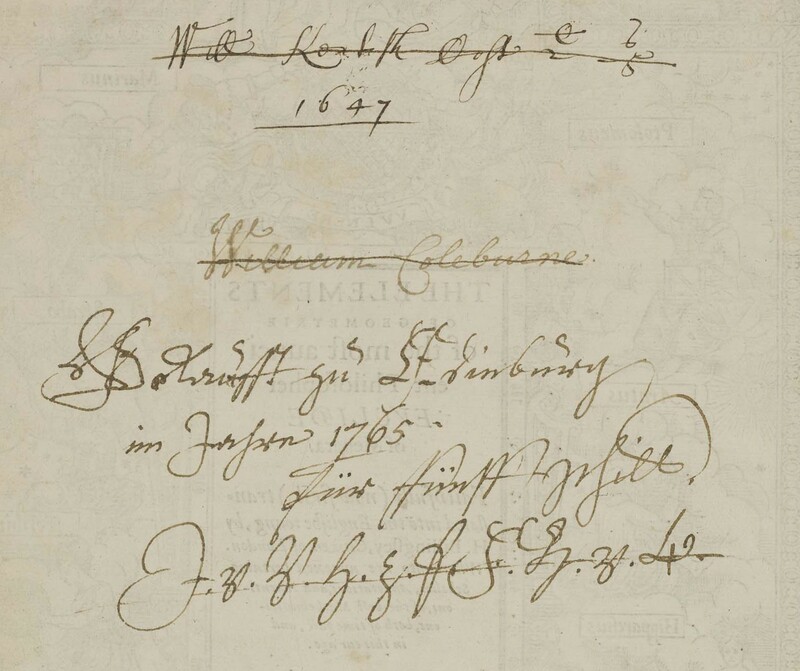 Underneath William Coleburne’s name, someone has written (or perhaps more accurately scrawled) words that look like: Gekaufft zu Edinburg in Januar 1765 für fünff [illegible] (Purchased in Edinburgh in January, 1765, for five [illegible]). As Veitch spent several years in Prussia, he must surely have been fluent in German, so it seems at least plausible that he wrote this. 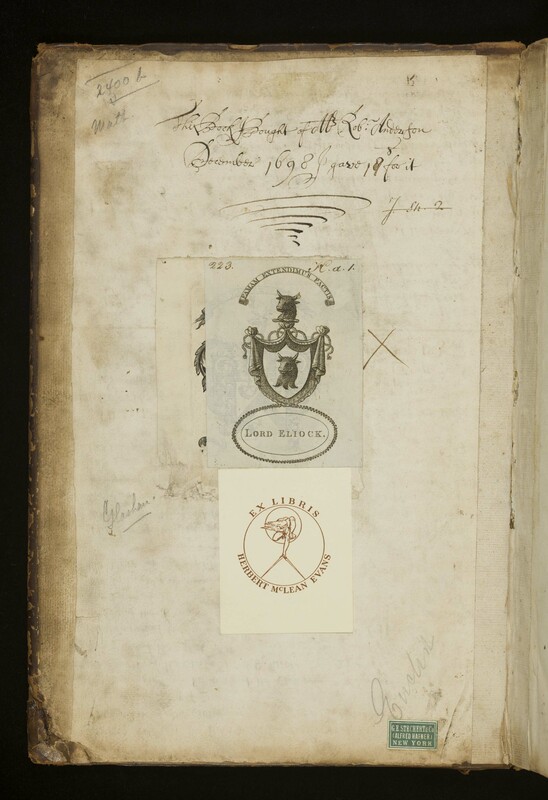 Above the bookplates, someone has written: “This book I bought of Mr. Robert Anderson December 1698 I gave [illegible] for it.” The name Robert Anderson is hardly uncommon, so we cannot identify this person with certainty. However, there is a somewhat obscure mathematician of this name, whose exact dates are not known. According to the Oxford Dictionary of National Biography, the mathematician Robert Anderson was active between 1666 and 1696. He was described by one of his contemporary mathematicians, John Collins, as “very able in algebra and solid geometry.” He published a book called Stereometrical Propositions (1668) and another called The Genuine Use and Effects of the Gunne as Well Experimentally as Mathematically Demonstrated (1674). Finally, there is a name we can’t make out with the date 1647. 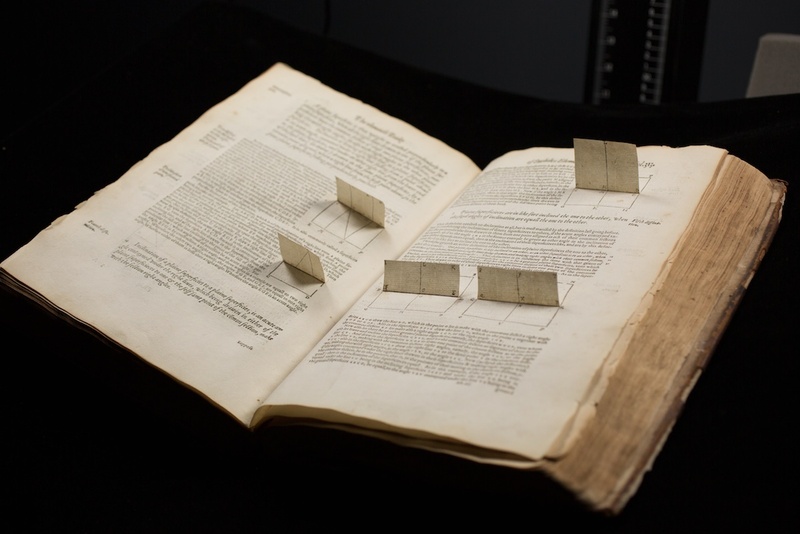 Interestingly, in the eighteenth century there was considerable interest in teaching geometry with three-dimensional models. The Whipple Museum of the History of Science in Cambridge has some eighteenth-century model kits used for teaching and learning geometry. For images of these models, see here. 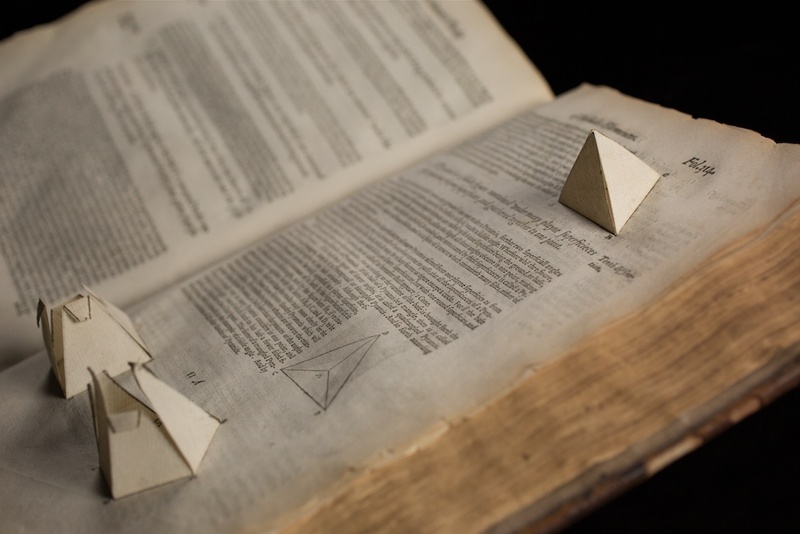 Is there any connection between the paper models of the first English Euclid and these wooden models? What I’ve presented here may read like a detective story without a proper ending. If anything, this investigation into the owners of OU’s English Euclid has opened up more questions than it answered. I’d like to make two broad observations about what I have learned from this investigation. First, it reminded me quite forcefully that books have long histories. Since my area of specialty is the sixteenth century, when I deal with books printed in the sixteenth century I tend to focus on the contexts in which they were produced (by authors and illustrators and printers) and the immediate uses of the book by different groups of readers. This is what all of the historical literature on the English Euclid, including Jonathan Self’s iBook, focuses on. But how was the book read and used by seventeenth-, eighteenth- and even nineteenth-century readers? It wasn’t always a historical artifact stored in a climate-controlled vault. The question of how the meanings and uses of books change over time is one that I don’t think gets asked enough in the history of the book. This translation of Euclid, with its tantalizing traces of former owners, invites further reflection on these issues. My second observation is that this was one of my first experiences of the powerful new possibilities for research and collaboration in the digital humanities, and new ways of integrating research and teaching. The exploration into the provenance of a unique book in OU’s History of Science Collections was part of a research project initiated by an undergraduate student as part of an undergraduate class. 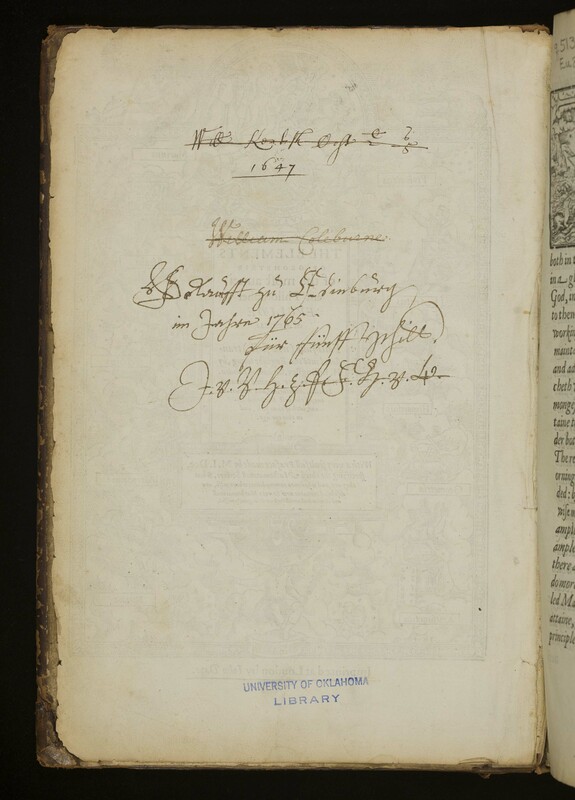 When Jonathan chose this book, he worked with Barbara Laufersweiler (@barbaraell) and her staff in OU’s Digitization Laboratory (@OULibDigitize) to get high quality images (and I do mean HIGH – the full size files are too big for this blog). It was the availability of these high quality images that made it possible for us to share the marks of ownership on Twitter and get expert advice from Andrew Aberdein, one of a large and generous community of twitterstorians. (For more reflections on the highly productive relationship between digital scholarship and book history, I recommend Matthew G. Kirschenbaum and Sarah Werner, “Digital Scholarship and Digital Studies: The State of the Discipline” Book History 17 (2014) pp. 406-458, available as a pdf on Sara Werner’s blog Wynken de Worde). A digitized copy of the entire book will eventually be available as an open-access resource to scholars, teachers and students of all kinds. All images courtesy of the OU History of Science Collections. This entry was tagged Digital HIstory, Euclid, Geometry, Henry Billingsley, HIstory of Mathematics, History of the Book, John Dee. Bookmark the permalink.